Our first award goes jointly to Glenn Humphreys, Bath & North East Somerset Council's Heritage Parks Manager, to Miles Barnes of Bath & North East Somerset Council's Property Services, and to conservation architect Rhys Brookes, of Harrison Brookes Architects, for their contributions to the restoration of Victoria Park. Royal Victoria Park was laid out in 1829 becoming one of the earliest public parks in the country and possibly the first created through public subscription. 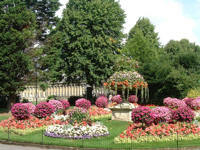 The Park has remained relatively unchanged since its creation, making it an important example of the Victorian style. When officially opened by an eleven year old Princess Victoria in 1830, she was so impressed that she designated it the Royal Victoria Park, a unique honour for an urban park. It is registered by English Heritage as a Park of National Historic Importance, and a number of structures within the park are separately listed as listed buildings. 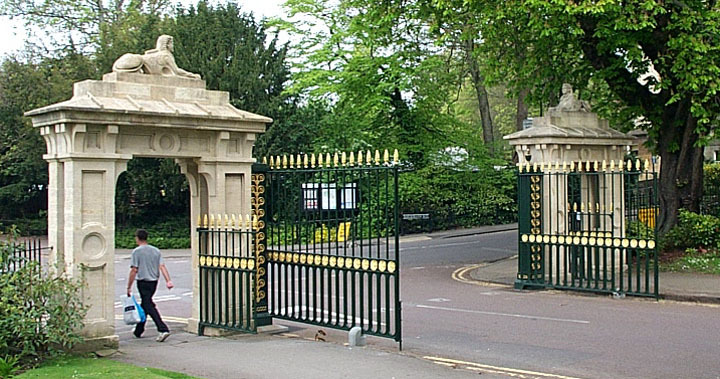 In particular, the gateways at both the Queens Parade and Marlborough Lane ends of Royal Avenue are Grade II listed, as is the Bandstand. Originally, the park was surrounded by railings, and iron gates were mounted at the entrances. But in 1942, these were surrendered as part of a Second World War national scrap metal campaign. It was our first nominee, Glenn Humphreys, who compiled the lottery bid and secured 1.5 Million to restore the park, and who has overseen the project. It was our second nominee Miles Barnes who secured the balance of the funds from Property Services budgets and handled many of the contractual arrangements, including the choice of our third nominee, Rhys Brookes. 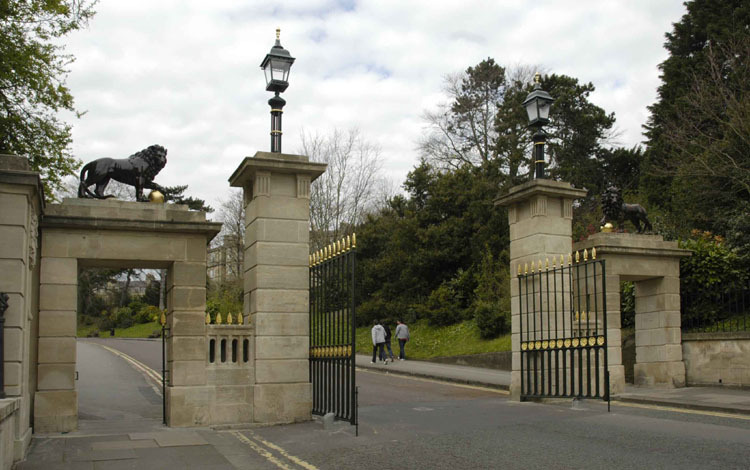 Many of us remember the ungated entrance as it was (picture right) with the pedestrian entrances topped by stone lions on a plinth bearing the inscription "Presented by G Geary Esq" (picture left) and yet gave little thought to how it once looked. Glenn Humphreys and Miles Barnes had the vision to see that it would look so much better if the park ornamentation was returned to the condition it was in when Princess Victoria opened it, and had the enthusiasm to obtain the funds to do it. This brings in our other nominee, Rhys Brookes, who led the detective work to establish how it did look. And that was not an easy job, but anybody lucky enough to discuss his research with Mr Brooks will know how important it was to him to get the results absolutely right. Because no official record was kept of the gates and railings when they were removed and almost none the records of the design of the gates have survived, recreating them has been a huge task, involving patterns being made for hundreds of details, and judgments being made on which parts of the original gates were in cast iron and which were wrought. 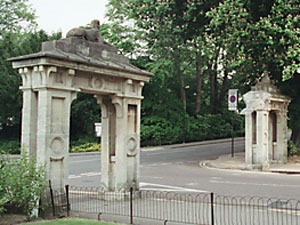 The English Heritage listing of the Marlborough Lane entrance is of little help: Pair of arches each surmounted by a human-headed lion (sphinxes?). One arch incised - "The Gift of Mr Reeves" the other - "Given by I Williams Esq". But with the aid of old postcards and photographs that included the gates, and by studying marks on the stone pillars of the gateways to gain further clues, a set of designs gradually emerged. 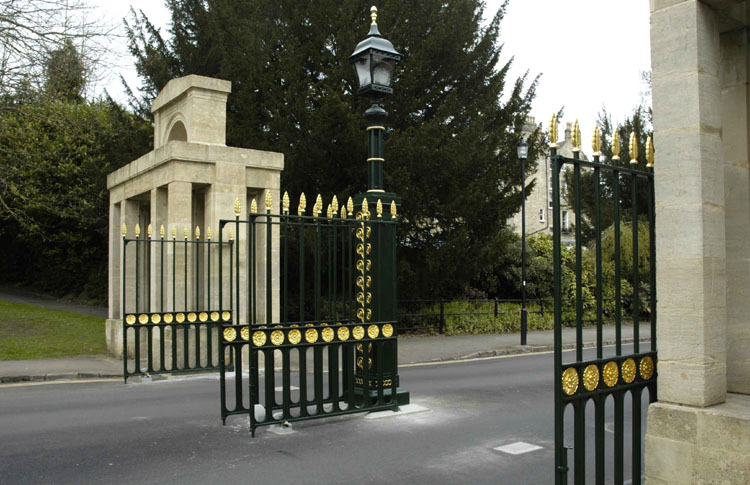 The real stroke of luck was finding a gate in Bathwick Hill which appeared to have come from the same foundry, which filled in many other details. Alongside that research came the smaller but equally important restoration tasks. Restoring the stonework and road surface, wiring the locations where the new lanterns were to be fitted, making the new lanterns, and carefully dismantling the lions to to replace the original iron supports inside the limbs which had rusted badly and had only a short life left. 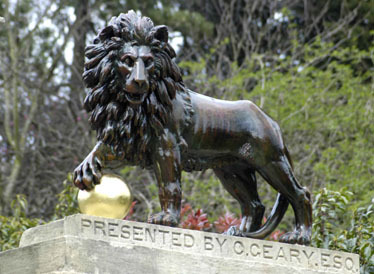 The restoration of the lions recovered fragments of paint found between the paws of the animals, confirming old photographic evidence that the lions had originally been painted, and analysis of those finds allowed the original paint to be recreated. 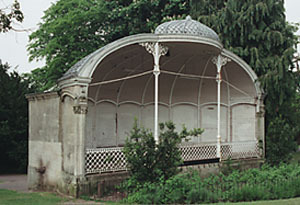 Also, the bandstand, even in a colour photograph, looked a colourless monochrome. Research showed that it wasn't always like that. 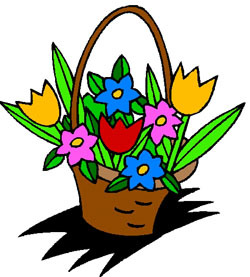 Small Watchdog bouquets (posies?) 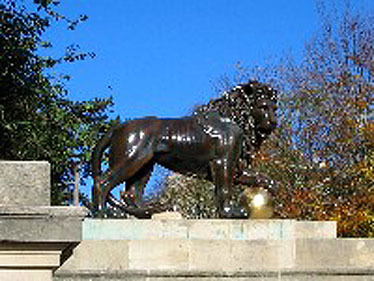 go to restoration specialists Nimbus in Frome for the repair of the lions, to Joy Huning and Saskia Paterson of Huning Decorations in Bath for the paint, and to Chris Topp who made the dozens of cast iron components that were assembled into the new lanterns. Earning the National Silver Award in the International Green Apple Awards 2006 for the Built Environment and Architectural Heritage, also places the Victoria Park Bandstand as an entry in the "National Treasures" book, and earns the council an award plaque. 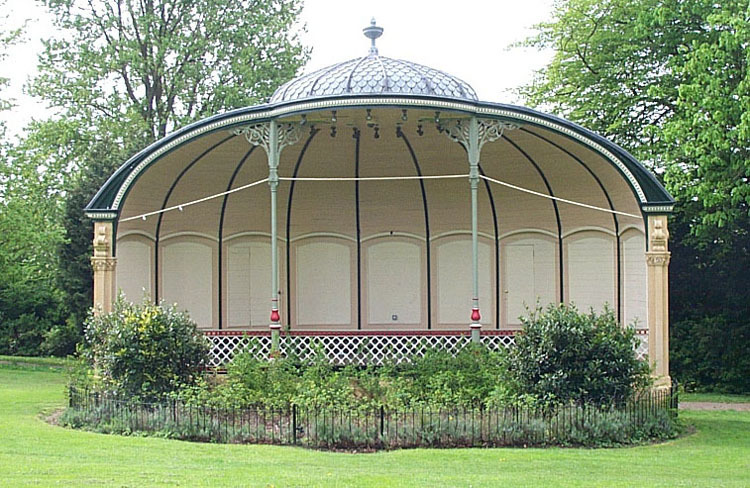 The bandstand restoration deserves a special mention because it earned the council a Green Apple Award (see box, right) from the Green Organisation. Our second nominee Miles Barnes specified the work and selected the contractors, and very clearly made the right choices. Green Apple awards are chosen from a world-wide list of nominations and according to the judges, the bandstand triumphed against some very strong competition. Everyone associated with this restoration of Victoria Park should feel proud. We know that there is much more to see, including new fencing and the restored urns, and we urge those in the area to explore the park properly, because we cannot photograph and feature it all. You will not be disappointed. 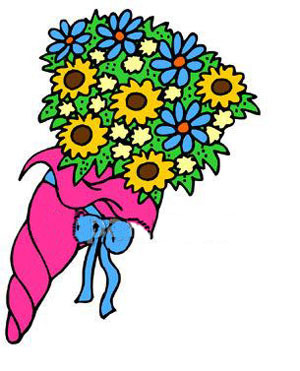 Our bouquets are richly deserved. 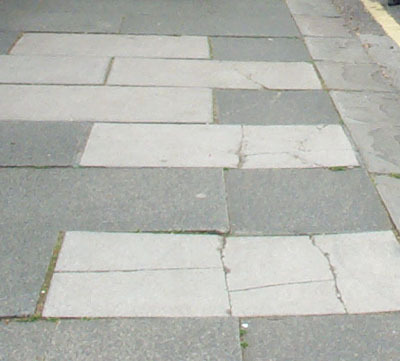 Clearly visible in the photograph on the left, the pavement in front of the left hand lion and in front of the War Memorial, is a hotch-potch of old and new paving in different shades and textures and degrees of damage. And that will be glaringly obvious in the foreground of the many, many photographs that will be taken in the future, particularly those taken in the sunshine. To complement this wonderfully restored park entrance, this paving should really be replaced, continuing the existing pennant stone surface from in front of Queens Parade round to the park entrance. It is only a few metres and shouldn't cost the earth. Can this be added to the schedule of remaining work?